So you’ve decided to install a rooflight in your home, but have you considered how to fit it? Preparation is key. One wrong move could prove costly so you should plan how to carry out the job before making a start. If you follow the instructions below, it should be relatively easy. There are two options when it comes to fitting your rooflight: you can hire a contractor to install it for you, or roll up your sleeves and get started. If you decide to go with the latter, it’s essential to familiarise yourself with the process first. That way you can be confident with the job at hand and with the end result. Download our installation guides here. However, unless you’re a trained builder or have years of DIY experience, we would recommend seeking the expertise of a contractor, even if it’s purely for consultation. Your rooflight will come with all the necessary materials but not the tools required for installation. If you don’t already have the following tools, we would recommend hiring or investing in them. 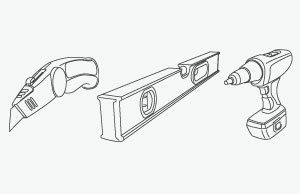 If in any doubt as to the right tool to go for, seek the assistance of your supplier or local hardware store. Before installing your rooflight, ensure that the areas surrounding it are clean and clear of debris. Any roof joists and decking should be secured fastened down and you need to check that you have enough manpower to safely lift and install your rooflight. Remove all of the packaging and check that you have all the parts required. Then place the lid on a flat surface to avoid damage. If your rooflight has an upstand, be sure to put this out of the way of the lid to reduce the risk of breakage. Place the upstand over the opening in your roof. Check that the pitch of the upstand is between 3 and 15 degrees using a spirit level. If it is any less than 3 degrees, water will simply sit on the glass. Fit the upstand using the brackets provided and secure it using the arris rails. Now you need to weatherproof the upstand using the membrane. Once this is completed you will need to fit the flashings to the upstand. Place the rooflight lid over the upstand to check that it will fit securely. Then secure the lid using the safety screws provided. Next, use the remaining screws to securely fit the unit in place. And there you go; it’s as easy as that. Remember that if you get stuck at any point you should contact your supplier or contractor for advice and assistance. 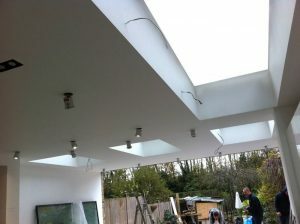 Ready to pick out your rooflights and transform your home? 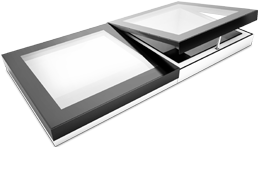 Contact EOS Rooflights today for more information on our extensive range of easy-to-fit rooflights.